Best Bushwalks around Macquarie Pass. Directions and maps provided. Where: Bottom of Macquarie Pass, NSW. Difficulty: Medium with some hard bits. Jump Rock bushwalk at the bottom of Macquarie Pass is amazing. The walk takes you through rain forest filled with giant Red Cedar trees. These beasts at spectacular. It’s a shame they where so heavily logged in the Illawarra region. This walk does give you a glimpse of what the area would have looked like before European settlement. Jump Rock itself is picturesque. Ideal to pack some lunch and spend a bit of time there. Make sure you have the track mapped out before you go as it’s very easy to lose it. There are some markers to show you the way so keep your eye out. There are some hard sections on this walk. I wouldn’t recommend it if you’ve had a hip replacement. Directions to Jump Rock trail. Google Map Link. The trail head to the Jump Rock bushwalk is at the bottom of Macquarie Pass. If your looking up at Macquarie Pass the track is on the left. Jump Rock hike Photo Gallery. 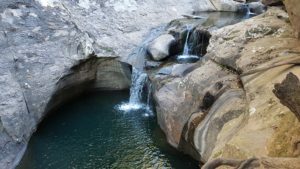 Jump rock bushwalk, jump rock hike, macquarie pass bushwalks, macquarie pass hikes, illawarra bushwalks.